My introduction to passion fruit (maracuya) came when I was teaching in Bogota, Colombia, where they enjoy a wonderful myriad of fruit. The locals and other teachers who had been there for a while taught me about the different fruits and showed me how to make juices from the frozen pulps that were available in all the stores. My favorites were maracuya and lulo, though I also enjoyed papaya, guava, and raspberry (frambuesa). Fresh maracuya is not widely available in our area, and when it is in the stores it comes with a high price tag. Goya has a range of frozen tropical fruit pulps that many of our local grocery stores sell, so I can still indulge my tropical fruit temptations without putting a serious dent in my budget. 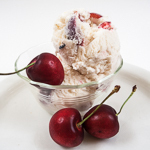 This ice cream has been on my list of things to try since I saw the photo in my copy of Spain and the World Table. The food stylist made a simple and beautiful presentation with a single scoop of ice cream and some colorful edible flowers. Though the original recipe called for hazelnuts, I used some of our macadamia nut stash that I brought back from Hawaii, and we really enjoyed the combination. Adapted from Spain and the World Table, by The Culinary Institute of America. In the saucepan, stir together the heavy cream, milk, granulated sugar, and vanilla bean. Bring to a simmer over medium heat, about 10 minutes. Remove from heat and cover. Allow to steep for about 15 minutes. Pour 1 cup of ice and 1 cup of water into the large bowl. In the medium bowl, whisk together the egg yolks and sugar. Return the cream mixture to the burner and bring back to a simmer over medium heat. Ladle 1/2 cup of the cream mixture into the eggs and whisk slowly to temper. Pour all the egg yolk mixture into the saucepan and whisk over medium-low heat. Stir constantly with a wooden spoon until the mixture thickens and your finger leaves a trail on the spoon. Strain the mixture into the medium bowl and set it in the ice bath. 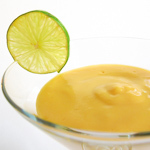 Whisk in the passion fruit puree. Cool in the ice bath, stirring constantly, until the mixture cools completely. Cover and refrigerate for at least 4 hours or overnight. Prepare your ice cream freezer according to the manufacturers directions. Freeze the custard in the machine, and add the chopped macadamia nuts during the last five minutes of churning. Transfer to another container and freeze for two more hours before serving. Prep time does not include freezing. Looks yummy:) Do you take your pictures outside or do you just have magnificent lighting? Thanks! Actually the natural light in my kitchen is horrible, so I either shoot outside or with a photo light on a stand (great birthday present). What a lovely flavor combination. I love both passion fruit and macadamia nuts so this is a pretty awesome looking ice-cream to me. Funny – I just posted an ice-cream recipe too and also mentioned Lydia’s avocado coconut milk ice-cream 😉 Great minds think alike! That looks wonderful! I’m so into making ice cream these days. I’ve seen those Goya products in the store. I’ll have to try them. Those look gorgeous, Andrea. The colors are so pretty and fresh. Can’t hold my tongue water…lol..2 see the flavorsome ice cream.I amazed 2 see those colorful edible flowers in the ice cream bcoz i hvn’t any idea abt any edible flower. This is a fantastic idea! I love it! My dad especially loves macadamia nuts. I’ll have to try this out and pass it on to him. Meeta, I’ve got the coconut milk, just need to find some good avocados for Lydia’s ice cream! Susan, I saw that mango blackberry ice cream you made. What a treat! Susan, thanks. I was expecting the ice cream to have a little more color, but the flavor more than made up for it. Kristen, thanks and I hope your dad likes it. I have seen those frozen pulps from Goya. Next time I need to stock up as the possibilities are endless. Great ice cream. I first had passion fruit in Australia and have loved it ever since. This ice cream sounds great! 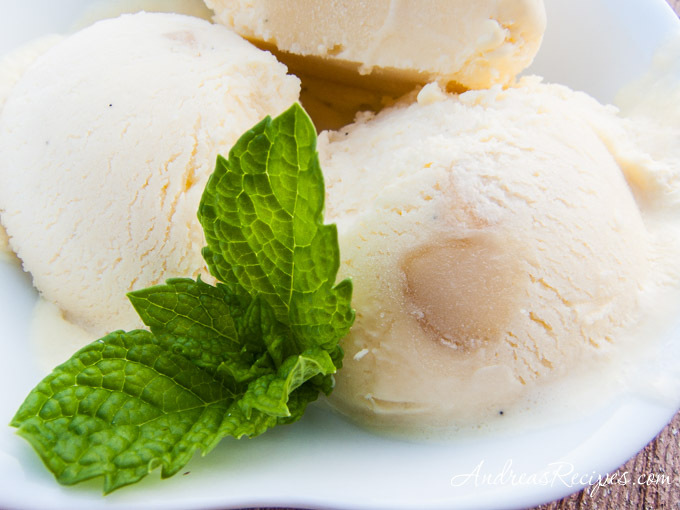 I love passion fruit and macadamias together.Your ice cream looks beautiful. Thank you for this awesome recipe! It was the first recipe that I made with my new ice cream maker and it was a biiiiig hit at work and at home! 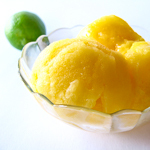 I LOVE passion fruit and I was so excited to find your recipe using macadamia nuts. Thank you for sharing your recipes with the world and I can’t wait to try more! There is an error in the recipe. In the first part it states mix the cream, milk and sugar and simmer. Then in the third part it says mix the yolks with the sugar. Which one is the correct step? I tried it once and it was delicious but I don’t remember how I did it.